In the wake of White Ribbon Night last weekend, LEAP’s National Marketing Manager, Claire James sat down with Brad Watts to discuss existing laws around domestic violence across Australian states. Brad is a Senior Consultant & Editor at By Lawyers, with access to a wealth of information on various important areas of Australian law. 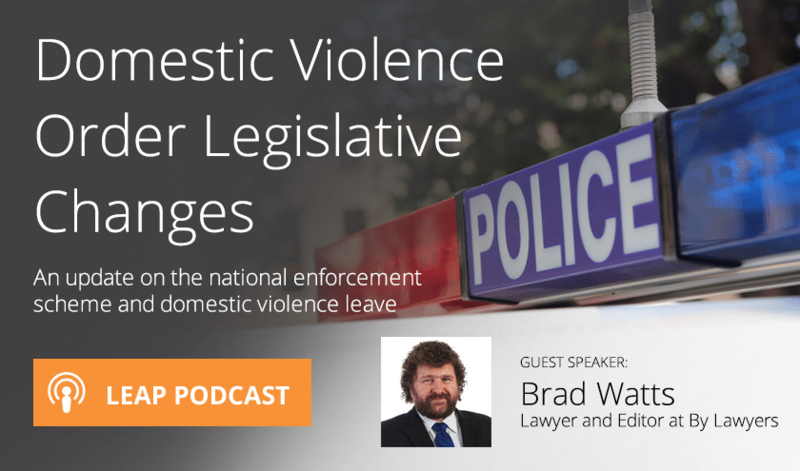 In the below podcast, Brad discusses two major legislative changes specifically relating to Domestic Violence Orders and employment law. CJ: Hi I’m Claire from LEAP Australia. Last weekend was White Ribbon Night, with thousands of community-based events showing a commitment to reduce violence against women across Australia, so I thought it was topical to speak to Brad Watts, lawyer and Editor at By Lawyers, about the laws relating to Domestic Violence across Australia. Welcome Brad! BW: Hi Claire and thanks for the opportunity to discuss this really important area. CJ: A pleasure. So, I understand there have been some significant recent developments in laws relating to domestic violence, across the country? BW: That’s right. There are two major legislative changes, one relating to domestic violence orders and one relating to employment law. CJ: Just before I get you to outline those changes, could I clear up the terminology? I have heard a few terms – Domestic Violence Order, Apprehended Violence Order, Restraining Order and Intervention Order. What’s the difference? BW: So, preventative court orders which prohibit any behaviour are generally called Restraining Orders. There is legislation in all states of Australia which creates a special type of restraining order directed at preventing violent behaviour, both personal violence which might occur between two unrelated people, and domestic violence such as occurs between people in a family or other intimate relationships. Admitted as a NSW solicitor in 1994, Brad spent 21 years in private practice, then 3 years as a government lawyer, before joining By Lawyers full time in 2018. Brad has extensive experience as a solicitor in private legal practice, including as principal, director and senior consultant. Having been an author of By Lawyers publications for 10 years and having extensive litigation experience, Brad offers a wealth of knowledge and practical assistance to LEAP users and By Lawyers subscribers. White Ribbon Australia promotes the prevention of violence against women in Australia by engaging men to make women’s safety a man’s issue too. To learn how you can support White Ribbon Australia’s vital prevention work in schools, workplaces & communities visit their website.